Many people enjoy pot edibles (also called weed edibles). There is a wide variety of pot edibles but at the mention of that, what many people usually think of is pot brownies. It’s the most common out there and also easy to bake. But have you tried something out of the regular? Strawberry weed muffins! Once you go know the best recipe to make some, I bet you will be making the best pot muffin you ever have. However, before I go on to list the recipe, it is important I mention a few precautions you must take: (1) try as much as you can to measure your ingredients accurately; (2) make sure you take notes, before and after the baking to know what mistakes and adjustments you have to make; and (3) as funny as this sounds, do not try to consume cannabis before baking. You will need to know what much effect it will have on you or the people you will be sharing the muffins with. Following these precautions will help you perfect your skills. So, would you like to make strawberry weed muffins for breakfast or you just want to show off your new baking skills to your friends? There are other things you might not be considering. Making this kind of delicacy is not only about the taste, it also has health benefits. 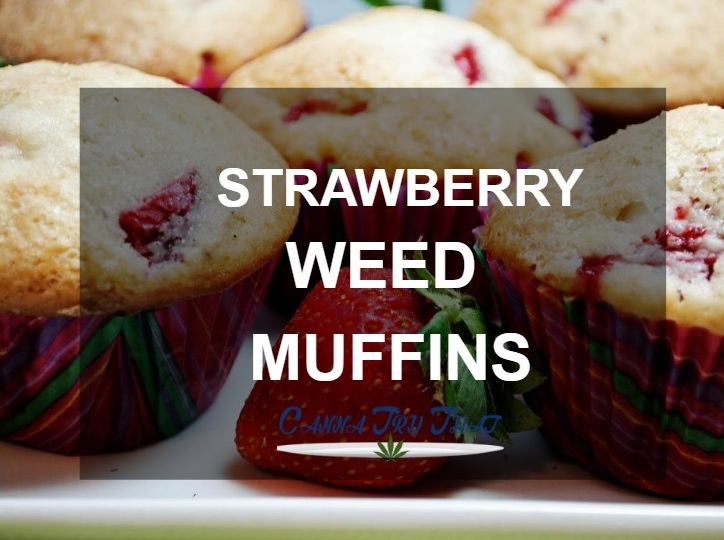 If you love muffins; love strawberries; and you also love cannabis, then you just stumbled across the best recipe that combines all your interest in one. And don’t worry if you are not a chef…I wasn’t really a great cook when I made my first muffins. If you stick with this recipe and follow the instructions as given, your strawberry weed muffins will come out just fine. So, get your apron on and let’s get down to business! In preparation for baking strawberry weed muffins, you will need to pre-heat your oven to about 390 degrees Fahrenheit. Get the following ingredients: sugar, flour, salt, oats, and baking powder. Mix them together thoroughly in a large mixing bowl and let the mixture disperse evenly, then set it aside. Reach for the cannabis butter (cannabutter), milk and egg. Mix these ingredients together in a separate and preferably smaller mixing bowl. Make a large crater in the bowl containing the dry ingredients and pour the liquid mixture of the smaller bowl in it. Stir for a minute, but not as much to avoid making it smooth. It should be a bit lumpy. Take the strawberries and dice them into your preferred sizes, then insert them deep into the mixture. If the sizes of the strawberries are not so big, you can also insert them as they are. It’s absolutely your choice to make. Using muffin liners, pour the final mixture into a muffin tin. But make sure you make room for the cake to swell in the muffin tin. Normally, ¼ of the space in the muffin tin should be reserved. It’s time to bake! Gently place these filled muffin tins in your pre-heated oven. Remember that the temperature should be regulated between 380 to 400 degrees Fahrenheit (which makes the temperature an average of 390 degrees). Bake your strawberry weed muffins for 25 – 30 minutes. After this, you must have a delicious cake waiting to be served. Allow the muffins to cool considerably by putting them on a wire rack.